The muse for this dress was Rockwell DeVil, the famous pinup model, and Mattel’s Original Barbie Doll. Above photo by the remarkable talent at Le Mew Studios. Rockwell LOVES the original Barbie Doll (of whom she has a portrait tattoo) and so do I. I have also always loved the vintage Barbie’s, “Solo in the Spotlight”; hence this dress. Let’s stop at this roadside attraction here for just a moment and revel in vintage Barbie. A Shot of “Solo in The Spotlight” dress from a fabulously-written blog post full of juicy details about Barbie. 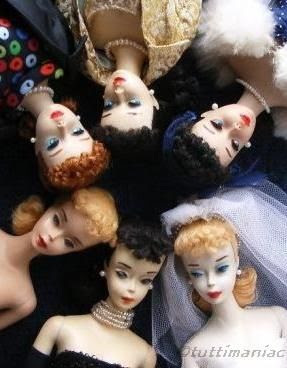 Click this pic to read.Tragically, I can only find a pic of the repro Barbie and dress for you. The original is much more beautiful and what causes our love affairs with Barbie… Sigh! To make this dress we built a completely custom dress form to duplicate Rockwell’s EVERY curve, based strictly on body pics and measurements done to the specifications that we send customers. It’s a 100% remote- we never fit the dress in person! At least one toile will be sent during the fitting process. This is made from our own locally hand-woven, gold-kissed cotton. If you look closely, the “polka dots” are actually tiny individual roses made from ribbon. The buttons down the back are covered buttons with loops and completely functional. There are no shortcuts or concessions; this is a movie star fit made with pure vintage construction techniques. Yet we can do this all at a distance. I’l explain that how we can do that more in another post. While we dyed the fabric for Rockwell’s dress to a gold-kissed peach- one of her favorite colors- the dress can be made in white kissed with silver or gold.. The bows here are bias-cut with couture construction, made of silk satin or silk chiffon. Heavy tulle netting is required under the lower skirt to support and is built-in. It can be ordered sleek with no buttons, bows or roses or customized using your imagination.